1800 - The Bronze Age begins in the Iberian Peninsula. The El Argar civilization begins to form. 1100 - The Phoenicians begin to settle in the region. They introduce iron and the potter's wheel. 900 - The Celtics arrive and settle northern Spain. 218 - The Second Punic War between Carthage and Rome is fought. Part of Spain becomes a Roman province called Hispania. 19 - All of Spain comes under the rule of the Roman Empire. 500 - The Visigoths take over much of Spain. 711 - The Moors invade Spain and name it al-Andalus. 718 - The Reconquista begins by the Christians to retake Spain. 1094 - El Cid conquers the city of Valencia from the Moors. 1137 - The Kingdom of Aragon is formed. 1139 - The Kingdom of Portugal is first established on the west coast of the Iberian Peninsula. 1469 - Isabella I of Castile and Ferdinand II of Aragon are married. 1478 - The Spanish Inquisitions begins. 1479 - The Kingdom of Spain is formed when Isabella and Ferdinand are made King and Queen uniting Aragon and Castile. 1492 - The Reconquista ends with the conquest of Grenada. The Jews are expelled from Spain. 1492 - Queen Isabella sponsors the expedition of explorer Christopher Columbus. He discovers the New World. 1520 - Spanish explorer Hernan Cortes conquers the Aztecs Empire in Mexico. 1532 - Explorer Francisco Pizarro conquers the Incan Empire and establishes the city of Lima. 1605 - Miguel de Cervantes publishes the first part of this epic novel Don Quixote. 1618 - The Thirty Years' War begins. 1761 - Spain joins the Seven Years' War against Great Britain. 1808 - The Peninsular War is fought against the French Empire led by Napoleon. 1808 - The Spanish American wars of independence begin. By 1833, the majority of the Spanish territories in America have gained their independence. 1814 - The Allies win the Peninsular War and Spain is free of French rule. 1881 - Artist Pablo Picasso is born in Malaga, Spain. 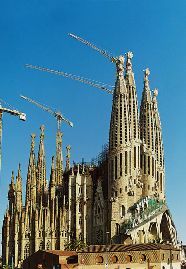 1883 - Architect Antoni Gaudi begins work on the Sagrada Familia Roman Catholic church in Barcelona. 1898 - The Spanish-American War is fought. Spain gives up Cuba, the Philippines, Puerto Rico, and Guam to the United States. 1914 - Spain remains neutral as World War I begins. 1931 - Spain becomes a republic. 1936 - The Spanish Civil War begins between the Republicans and the Nationalists led by Francisco Franco. Nazi Germany and Fascist Italy support the Nationalists. 1939 - The Nationalists win the civil war and Francisco Franco becomes dictator of Spain. He will remain dictator for 36 years. 1939 - World War II begins. Spain remains neutral in battle, but supports the Axis Powers and Germany. 1959 - The "Spanish miracle", a period of economic growth and prosperity in the country, begins. 1975 - Dictator Francisco Franco dies. Juan Carlos I becomes king. 1976 - Spain begins a transition to a democracy. 1978 - The Spanish Constitution is issued granting freedom of speech, press, religion, and association. 1982 - Spain joins NATO (North Atlantic Treaty Organization). 1986 - Spain joins the European Union. 1992 - The Summer Olympics is held in Barcelona. 1996 - Jose Maria Aznar becomes Prime Minister of Spain. 2004 - Terrorists bomb trains in Madrid killing 199 people and injuring thousands. 2009 - Spain enters economic crisis. Unemployment will rise to over 27% by 2013. 2010 - Spain wins the FIFA World Cup in soccer. Spain is located in Southwest Europe on the eastern Iberian Peninsula which it shares with Portugal. The Iberian Peninsula has been occupied by many empires over the centuries. The Phoenicians arrived in the 9th century BC, followed by the Greeks, Carthaginians, and the Romans. The Roman Empire would have a lasting impact on Spain's culture. Later, the Visigoths arrived and drove out the Romans. In 711 the Moors came across the Mediterranean Sea from North Africa and conquered most of Spain. They would remain there for hundreds of years until the Europeans would retake Spain as part of the Reconquista. In the 1500s, during the Age of Exploration, Spain became the most powerful country in Europe and likely the world. This was due to their colonies in the Americas and the gold and great wealth they acquired from them. Spanish conquistadors such as Hernan Cortes and Francisco Pizarro conquered much of the Americas and claimed them for Spain. However, in 1588 in a battle of the world's great navies, the British defeated the Spanish Armada. This started the decline of the Spanish Empire. In the 1800s many of Spain's colonies started revolutions to separate from Spain. Spain was fighting too many wars and losing most of them. When Spain lost the Spanish-American war against the United States in 1898, they lost many of their primary colonies. In 1936, Spain had a civil war. The nationalist forces won and General Francisco Franco became leader and ruled until 1975. Spain managed to remain neutral during World War II, but somewhat sided with Germany, making things difficult after the war. Since the death of the dictator Franco, Spain has moved toward reforms and improving its economy. Spain became a member of the European Union in 1986.